I presented a session on the use of iPhones in secondary (choral) music education this afternoon, and I felt that I should include a tuning program or two, for the sake of instrumental music teachers. 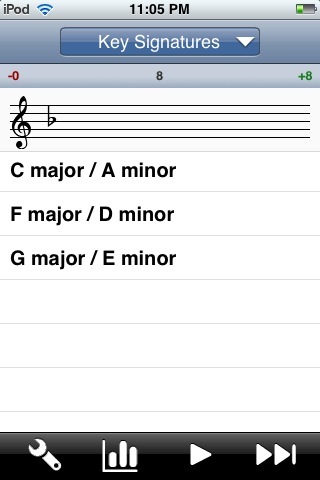 Although there seemed to be about four tuning programs at the AppStore, only two had multi-function to include a number of instruments with different timbres and ranges. One of those two programs is the $0.99 “Just Tune” which includes a tuner, metronome, and pitch generator/tuning tone. From the very start, the program is misnamed, as it is more than a tuner. The tuner is attractive, clearly shows the pitch you are playing, and indicated whether you are flat or sharp. The only negative aspect of the graphics is the ever present guitar in the lower right corner, as the tuner is designed to tune more than a guitar. I had a chance to try this tuner with two lower-pitched instruments, a string bass and a tuba. Just Tune was able to discriminate the pitch of both instruments, but had more difficulty on the string bass, even when the iPhone was held directly next to the instrument’s f-hole (yes, that term made us giggle as undergraduate music majors). I’d describe the program’s tuning characteristics as “twitchy,” almost as if it reacted too quickly to changes in pitch. The program also includes a metronome, which is a nice feature to include, and it shares the same graphic “feel” as the tuner. 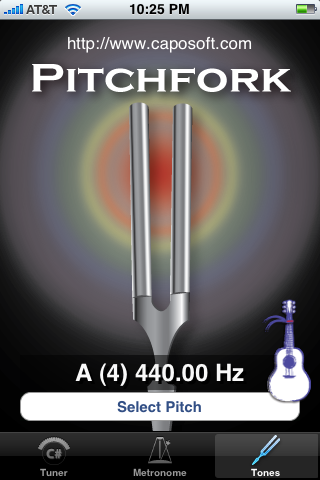 The final part of this program is a tone generator, which could function well as a pitch pipe, but it can be problematic to quickly change pitches as needed by singers…however, for an instrumental music teacher, who usually uses a tone generator on Bb or A, this is a welcome addition. The sounds created by the tuner are very loud on the iPhone, almost at a level that would be functional for use with a band. All in all, Just Tune is a great program for $0.99. . I will post another review of a competitor’s product (Cleartune) in a future post. A free alternative to MooCow Music’s Pianist is FreePiano, which gives you two octaves on the keyboard, in choices of the voice of a grand piano or a toy piano. 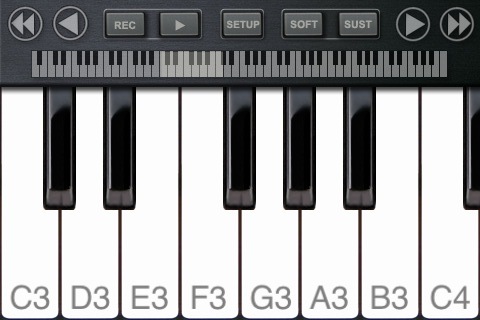 There are no options for recording or different octaves, and the keys are smaller than MooCow’s Music Pianist. Ultimately, if all you need is a piano with two octaves, FreePiano is your option. 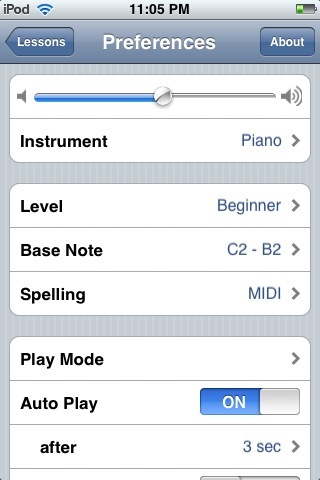 If you’d like some additional options, pay the $3.99 for MooCow’s Pianist. 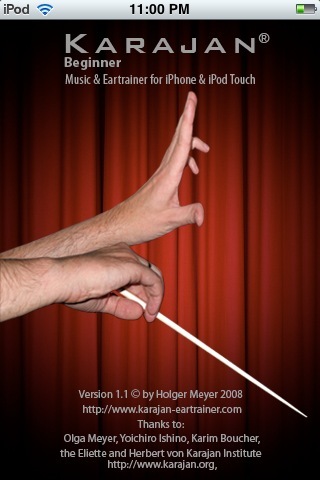 One of the music applications that has been available is called Karajan, available in both a beginner (free) and full ($14.99) at the Apple AppStore. It is a music and ear trainer for the iPhone and iPod Touch. Music theory is a challenging college course, but ear training courses tend to be more so. Karajan, from the introduction of the AppStore, has provided an application that is geared to help the musician learn some basic theory items, and more importantly, to train the ear. The beginner version of the program allows you to “train” in several areas: Intervals, Chords, Scales, Pitch, Tempo, and Key Signatures. The full version of the program may offer more areas of focus. In the beginner version of Karajan, you are tested on your ability to identify specific intervals (only a Perfect Union, Major Second, Perfect Fourth, Perfect Fifth, and Octave). All other intervals are likely included in the full version. When you identify intervals, you are told by a pop-up whether you were correct or incorrect in your answer. I personally believe that the interval part of the application is valuable, as identifying intervals is a key component of successful sight reading, as well as dictation of music. 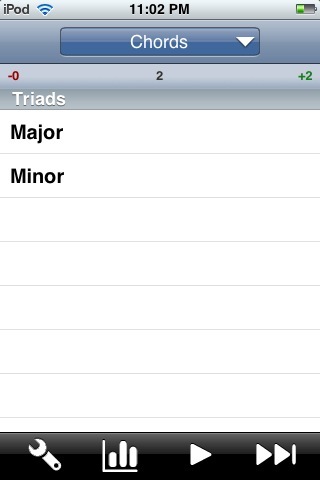 It would be nice if the user had the option to identify intervals visually as well as aurally. Another useful element is the Chords area of the program, identifying each kind of chord (only Major and Minor in this case) by ear. Once again, it would be beneficial if the program would also require you to identify chords visually. Another interesting feature focuses on scales, identifying them by ear. 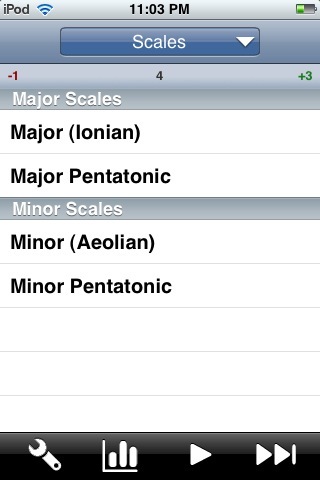 I can see the benefit of this task…but I had never heard a minor pentatonic scale before. Once again, I would also want the ability to test scales by sight, not just sound. The last truly useful element of the program featured a visual identification of Key Signatures (Only three in the beginner program). The last two components of the program did not seem very useful to me, as a music major. First was a set of exercises which focused on identifying specific pitches. I know some individuals believe you can develop perfect pitch…I have not experienced that fact for myself. I have seen how musicians develop relative pitch. Ultimately, this exercise isn’t very useful, at least in American music education. 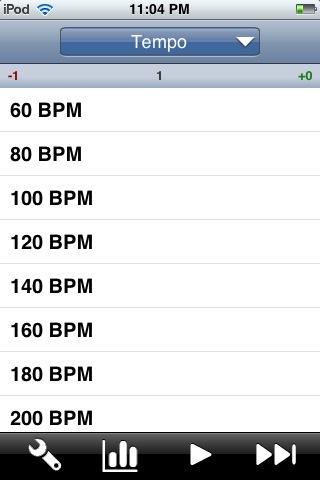 Another odd component was a set of exercises built around identifying specific tempos, within twenty beats per minute. This also appears to be a useless exercise for me, partially as tempos are relative to interpretation–and as metronomes are so accessible in our culture. The exercise would be more useful, in my opinion, if a specific tempo was played and the musician was asked which Italian tempo terminology (Andante, Allegro, Presto, Grave, etc.) was most appropriate. This component really missed the mark for me. Although Karajan is a well-designed, attractive, and functional program, I’m not sure it does all the things it could do as a music and ear training tool. The program has some very useful tools (to a point, with the beginner program), but it also has some tools that are basically useless for American music students. The program already covers some visual literacy (key signatures) and should do the same for scales, intervals, and chords. Perhaps the full version of Karajan includes these items…but at $14.99, I’m not going to take the risk and buy the program. And the beginner program is so limited in function that I can’t recommend it, either. As a result, I don’t recommend this program…unless two things happen. First, a decrease in price, matching other programs ($5.00 tops) would perhaps make the additional ear training with intervals, chords, and scales worth the investment. Second, visual tests of intervals, chords, and scales would also be very beneficial. Gengar Studio has created a program called Pitch Pipe which sells for $2.99 at the Apple AppStore. As I have previously mentioned, I teach high school choir, and choirs often have the need for a reference pitch. As of the date of this review, there are two pitch pipe applications available, and of the two, I chose to purchase this program. The program is simple and effective, with clean graphics and ease of use. When a pitch plays, the pitch is highlighted on the screen, and it appears at the bottom of the screen as well. The sounds, with one exception (which I will mention in a moment) are good, and I particularly like the volume slider on the bottom of the program. I have used Pocket PCs and Palm devices in the past to give pitches for various events (singing the National Anthem at a Minnesota Twins game, or to give a pitch backstage with the Minnesota Opera) , and the ability to adjust volume ON the same page as the pitch pipe itself is a great thing. There are two things, and only two things, that the program could improve upon. The first is to offer various pitches for the “home key” of the pitch pipe, such as with the original Master Key Pitch Pipe. The C to C is offered, and is the most popular, but an F to F and E-flat to E-flat should also be offered. Second, the sampled songs fade in, so that there isn’t an abrupt start to the sound. Unfortunately, the sampled sound isn’t very long, and you can hear the “dip” in the sound as the “fade-in” loops in the recording. The “dip” almost sounds like a change in pitch. I would suggest sampling a pure wave of sound, and allowing the program itself control the “fade in” as the sound begins. As a teacher, I wish I could offer a pitch for the length of time of the recording…but there are times when a pitch needs to be sounded longer. Ultimately, this is a real negative, as some other programs offer sine wav sounds that last indefinitely. If you have a 1st generation iPod touch, you’ll need a way to amplify the sound from the headphone jack, otherwise all iPhones and 2nd generation iPod touch models will project the sound over the external speaker. At $2.99, this program is a good value, and it looks great and works reasonably well. Considering a actual Master Key Pipe will cost you between $18 and $25, not counting shipping or tax, that’s a bargain! This program is recommended for use in music education. 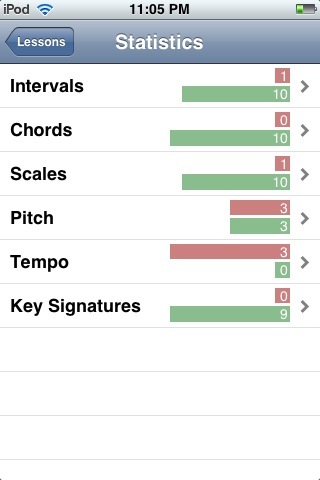 This handy application provides pitch references for musicians and singers. It’s a chromatic pitch pipe ideal for a cappella singers and timpanists. With thirteen pitches, each a half step above the previous, Pitch Pipe provides all of the notes of a single octave, so a singer can start in any key required by Western music. To use, play the initial key note or tonic of the piece to be sung. You can also play the first sung note of the song, particularly when the song begins in unison or with a solo. 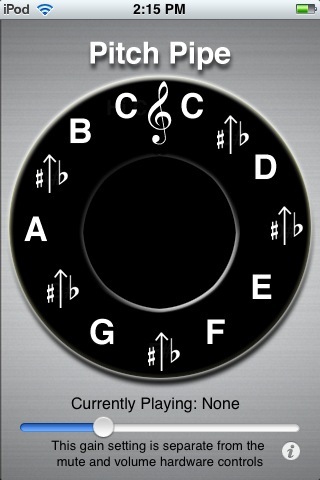 Having a Pitch Pipe inn your iPhone is useful because you always have it with you. Normal pitch pipes can gradually change pitch as the material hardens with use, and since they are often carried in a pocket, lint can work its way into the device and affect the sound. 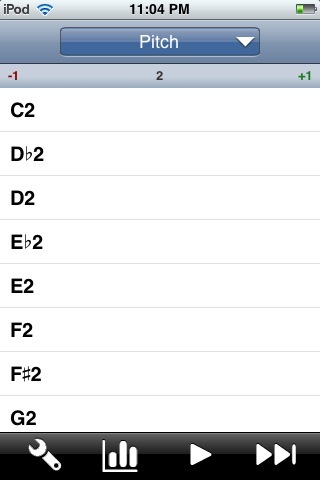 Pitch Pipe for iPhone has none of these problems. 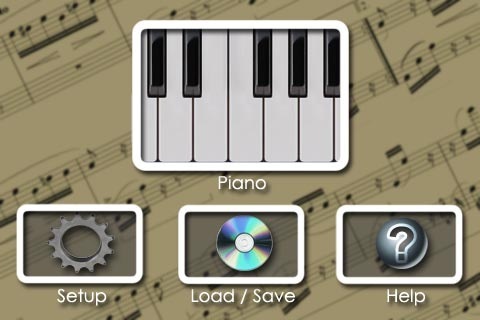 The first review I will offer is for MooCow Music’s Pianist, which costs $5.99 at the AppStore. This application was actually created before the Apple AppStore came into existence, for “jailbroken” iPhones and iPod Touches. 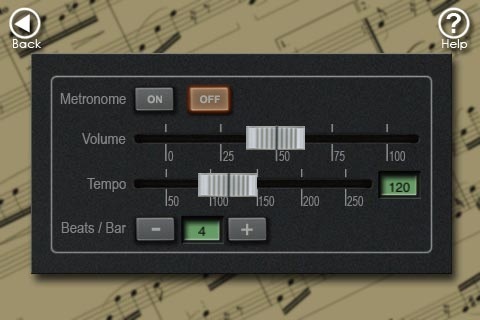 Ultimately, it turns your device into a small synthesizer, with up to five note polyphony. I personally wish there was an option in the program to turn this off, and that you could immediately go to the keyboard (when you want the keyboard, that’s what you want to get to), but at the moment, there is no way to do so with the program. 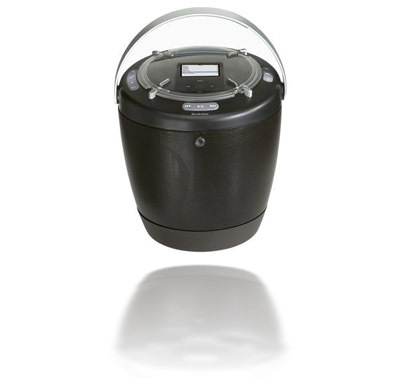 The main aspect of instrument settings is the Global Volume feature. 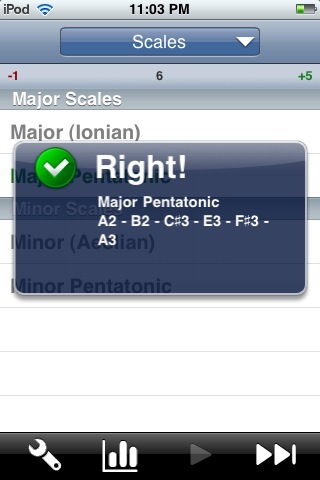 I wish this was available on the main piano screen; ultimately it is two clicks (or “touches” away). 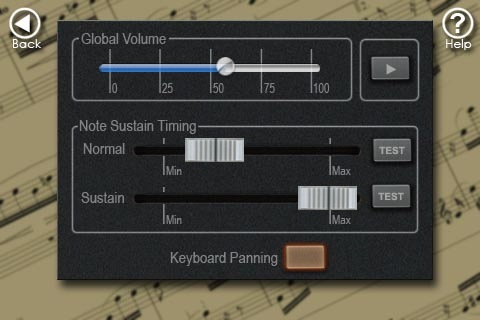 Or, I’d like the main piano screen to show the current volume. And here is the Metronome. It is easy to work with, but again, is two “touches” away from the piano screen. 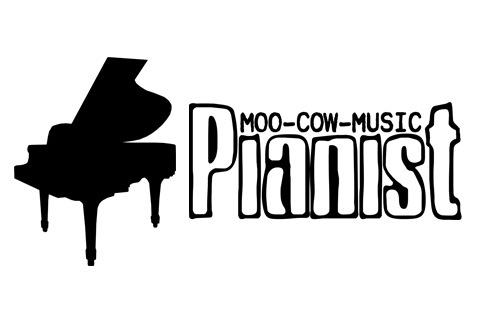 In summary, MooCow’s Pianist is a very good application for music educators. If you have an iPhone or 2nd generation touch (both have external speakers) , the program will be useful anywhere, any time. You can use it on location to lead warm-ups for a choir, or ask your students to consider downloading it so they can practice music at home. If you have a 1st Generation iPod Touch, you’ll need headphones or an external amplifier of some type to make use of the program. The recorder could be more functional, such as allowing you to import (and export!) 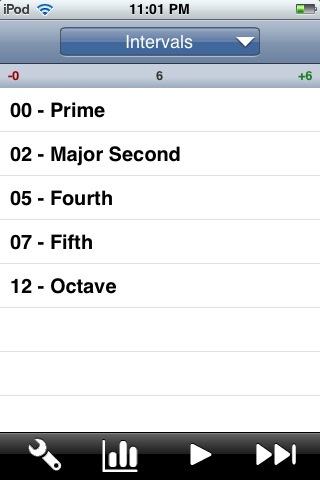 MIDI files, or even recorded songs from other users of the application. As I mentioned before, it would be fantastic if you could access the metronome or master volume with one “touch” rather than two, and it would be great to be able to turn off the main MooCow splash screen. Under the iPhone/Touch operating system 2.0, Pianist would crash occasionally, requiring a ful device power-up; I have experienced no crashes under the new 2.1 operating system. I would like to see future versions of this software have the ability to link with music notation software (through Bluetooth, perhaps) such as Finale or Sibelius. That is, perhaps, a long way off, but the concept has potential should a developer wish to examine the possibilities! Ultimately, for use in music education, this is an application I would HIGHLY recommend for use by teachers and students. After all, you are buying a useful synthesizer for $5.99, whereas those old Casio dual-octave synthesizers (also without MIDI or the ability to record) cost five times as much, with worse sound! 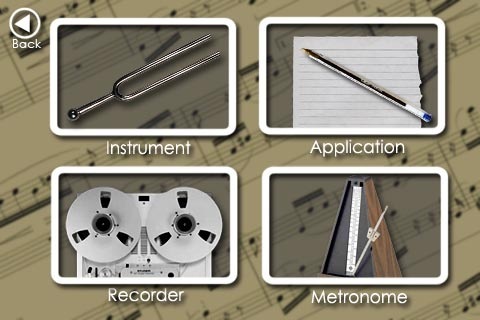 Welcome to the iPhone Apps for Music Education blog! I am a secondary teacher in music education, currently teaching vocal music, but I am also licensed in instrumental (band/orchestra) and general music. I also teach courses in music history and music theory at the high school level. This blog will share my findings (and reviews) of various applications that are useful for music education. At the time of writing, I own several iPods, and I use iPods on a regular basis in my teaching. The iPods I use at school (4GB 3rd Generation iPod “Fatty” Nanos) were obtained through a grant, and we use those iPods with the Brookstone Boombucket, which is a fantastic piece of technology…it allows you to amplify music anywhere (battery powered) yet still is portable for use by students (they go to sectionals to rehearse in various places). I will be purchasing an iPhone in October 2008, as I currently hold a contract with Verizon which will expire soon. I cannot cancel early, as I do not wish to absorb a $175 early termination fee–per line! Please feel free to add comments or to post questions. This blog is based off my own purchases and observations, and is not sponsored by any software company or Apple. Likewise, if you have an application you want me to review, a review may need to wait until I can purchase an application! Author choirguyPosted on September 20, 2008 November 15, 2010 Categories General MusingsLeave a comment on Welcome!